▼Click the image to read an English summary of the Japanese article. Almost five years have passed since the meltdown began at TEPCO’s Fukushima Daiichi. The natural decay of radioactive substances and the decontamination work have brought the radiation level down to some extent. The meltdown, however, is still seriously affecting the living and lifestyles of many people in Fukushima. Today, here in Fukushima, we see more parents and children than before at supermarkets buying food produced in Fukushima. We see children’s clothing swinging and drying beside windows. (Hanging washed clothes to dry them is a common practice in Japan.) Still, some 70,000 people, by government order, are living as refugees. For many of them, life is simply not the same since the meltdown. Moreover, troubling issues experienced by the citizens of Fukushima never seem to be resolved. Such an issue that causes real agony for a 40-year-old mother, who moved with her husband and child into Koriyama from a coastal region of Fukushima shortly after the meltdown began, has to do with school lunches. Her 11-year-old daughter, a fifth grader, has to take her packed lunch out of her school bag, while some of her class mates serve other children the school provided meal (a common practice at many elementary schools in Japan). Even though the ingredients used in the meals provided by the schools, if they are produced in Fukushima, have passed radioactivity inspections, her mother is deeply worried over the daughter’s health and prepares a packed lunch for her every day. In the School Year 2015 (April 2015 through March 2016, in Japan), 27.3% of Fukushima’s school meal ingredients were produced in Fukushima, up from the year before by 5.4%. This is possibly a sign of food safety being restored, to some extent. As the chart in the article above shows, since shortly after the 2011 disaster, school meals in Fukushima Prefecture have gradually been using more farm products from the prefecture. Still, a certain mother of an elementary student, resident in Koriyama, has never bought any food produced in Fukushima since the 2011 disaster. She is even hesitant with foods from northern Kanto (just south of Fukushima). Though she lets her child eat school meals, it is simply because she cannot find a practical alternative. Today, five years after the meltdown began, this mother is still worried over food safety. She said she is determined to avoid made-in-Fukushima foods. Here in Fukushima, countless mothers are worried about radiation, with no one to talk to about their worries. One way or another, a mother’s anxiety will inevitably affect her family and children. Using ingredients from Fukushima can show the world that the prefecture is rebuilding, yet the worries of countless mothers must not be ignored. Fukushima Minpo has reported on many other troubles caused by the meltdown. Some couples broke up when the mother and her children evacuated alone. Some mothers received compensation for damages suffered, while some of their neighbors did not. Naturally, those neighbors express their anger at those who received compensation. Professor Sung Won-Cheol of Chukyo University and his fellows have continuously conducted a survey, targeted at mothers having a child between 1 and 2 years of age, since shortly after the meltdown began. The survey covers 9 municipalities in Fukushima Prefecture, including Fukushima City. Childhood experiences play a crucial role in the development of a child’s mind. In Fukushima and vicinity, radiation is badly affecting the childhoods of many children. Before it is too late, we need to restore an environment wherein parents can take care of their kids in peace. ▼Click each image to read an English summary of the Japanese article. Fukushima Minpo – TEPCO, on February 9th, 2016, built “ice wall” water shields, which the power company claims to be the “super trump” to contain contaminated water from its Fukushima Daiichi Nuclear Power Plant (NPP). TEPCO plans to “freeze” the walls by the end of the current fiscal year, ending in March 2016. Japan’s Nuclear Regulation Authority (NRA), however, refuses to give a go-ahead to the walls, and no one knows how soon the walls can come into use. Unless the NRA gives its approval, the walls will remain “lukewarm,” at least for the rest of the current fiscal year. Asahi Shimbun – TEPCO has been building “ice wall” water shields to contain contaminated water from its Fukushima Daiichi. The walls, however, are now “standing still” – the power company is unable to get the final freezing done. Japan’s Nuclear Regulation Authority (NRA) has not given permission to use the ice walls, arguing that the walls could lead to further leakage of contaminated water, depending on underground water flow. No one knows if TEPCO will ever be able to convince the NRA of the walls’ benefits. Akahata – When TEPCO announced its plan to build “ice walls,” many doubted whether or not such walls of frozen soil would ever become reality. Furthermore, the Japanese Society of Limnology pointed out that “such walls can lead to worse accidents.” TEPCO has been asked to take careful measures before bringing the frozen shields into use, which could cause new disasters. In its struggle to contain the contaminated water from the Fukushima Daiichi Nuclear Power Plant (NPP), TEPCO has resorted to building “ice walls*.” Presently, the walls are there, and yet the power company cannot start the final “freezing” of the walls. Japan’s Nuclear Regulation Authority (NRA) refuses to give the wall freezing a go-ahead, pointing out that rather than containing such water, as claimed by the power company, the water-shields could lead to further leakage of contaminated water. On February 9th, TEPCO announced the wall building work was done. Still, no one knows if the NRA will ever approve the walls for use. (*) What are the “ice walls”? At the Fukushima Daiichi NPP, under the reactor buildings where the melted nuclear fuel has fallen to the ground, underground water has been running into contact with the melted fuel, creating highly contaminated water. To counteract this, TEPCO announced a plan to surround the underground portions of reactors 1 through 4 with “ice walls,” 1,500m (0.93 mile) in total length. TEPCO installed numerous freezer pipes, 1,568 in number, 30m (33 yards) below the ground surface, with two pipes 1m (1.1 yard) apart from each other. The plan is to circulate a liquid coolant, 30C below the freezing point (22F below zero), through those pipes to freeze the soil surrounding the pipes. There is no precedence for such gigantic ice walls, however, and no evidence that the power company can maintain the frozen walls until 2020, as it claims to be able to do. Naturally, many are voicing their concerns over the ice wall plan. TEPCO is spending some JPY34.5 billion on the walls, which could well prove to be a huge extravagance. What is wrong with the “ice walls”? The Nuclear Regulation Authority (NRA) of Japan must give approval to the walls, yet the NRA has been doubtful about their effectiveness since the very beginning. If the underground water level goes below the ice walls, some of the highly contaminated water from the reactor buildings could leak into the soil outside the walls. The NRA’s committee to determine whether or not the walls can function safely has asked the power company, over and over again, why it insists on the ice walls among so many other options. The committee’s chairperson, Mr. Shunichi Tanaka, even went on to say, “TEPCO’s grave error is that it is spreading the false belief that the ice walls, once built, can eliminate the whole issue of contaminated water,” in the spring of 2015. In fact, TEPCO held a trial freezing of the walls in 2015, and discovered the underground water level was lower than expected in some places. The levels differed from one location to another, and much remains unknown about the water flow rates and directions. Those walls, once frozen, take 2 months or so to melt. Thus, in case a problem is detected, no quick fix exists. Fukushima Minpo – Once cheered as a dream nuclear reactor, generating more fuel than it consumes, the Monju FBR (located in Tsuruga, Fukui Pref., some 62 miles NNE of Kyoto) is now facing the final judgment. Fukushima Minpo – It was learned, on February 16, 2016, that the Japan Atomic Energy Agency, the operator of the Monju FBR (Tsuruga, Fukui Pref., Japan), estimated in 2012 that decommissioning the FBR could cost some JPY300 billion. Previously the Agency had not announced the cost of decommissioning. Akahata – Already, more than a trillion (JPY) of national tax money has been spent on Monju, a FBR that has seldom been in operation since it was stopped following a sodium leak in 1995. Decommissioning the reactor could have a gigantic cost. This discovery, made public for the first time, about how much it could cost to decommission the FBR, makes clear that it will costeveral time more than decommissioning an average light water reactor. The non-operating breeder reactor has been a goliath money-eater, eating up more than JPY1 trillion with almost no power generated. Restarting it, instead of decommissioning it, could cost more than JPY100 billion for repairs, etc. Whether it is left alive or put to death, the goliath will remain a gigantic money-eater. Monju is a fast breeder reactor, which runs on mixed oxide (MOX) fuel, a mixture of plutonium and uranium, and uses “fast” neutrons to cause nuclear fission. (Common light water reactors use slow neutrons.) A FBR generates more plutonium than it consumes for power generation, assuming there is power generation by the plant. Thus, it is called a “breeder.” Japan’s government, calling it the “dream reactor,” treated it as an indispensable component of the nation’s “nuclear fuel cycle,” which also requires a reprocessing plant for used nuclear fuels. Thus, the government has so far spent more than JPY1 trillion of tax money on FBR research and development. In spite of this megabuck spending, the FBR history has been a series of accidents and serious problems. Seldom has it produced any power. In 2012, it was discovered that an equipment checkup at Monju failed to cover many important items. The Nuclear Regulation Authority (NRA,) in May 2013, gave an in-effect stoppage order to the FBR. So, why has this money-eater been around so far? The question should be, in fact, why have they not been able to decommission it? Japan already has more than 47 t (103,617 lb.) of plutonium, which can be used to produce several thousands of plutonium warheads. International society allows Japan to have the plutonium, on condition that Japan uses all of it for peaceful purposes—power generation at Monju, etc. Decommissioning Monju would, therefore, cause many in the outside world to suspect that Japan is building nuclear weapons. Yet another reason is that the Japanese government wants to build a “lavatory” for used nuclear fuels. A FBR was intended to recycle used nuclear fuels. Now, after all those never-ceasing accidents and problems, the “lavatory” has proven to be non-existent. Still, if the government gave up on this nuclear fuel cycle, it would mean, in effect, that it is admitting that there is no nuclear fuel “lavatory.” Not just the government, but reactor builders and power companies who want to restart existing nuclear power plants want to keep alive the myth that a “lavatory” can be built. Letting Monju survive is obviously just putting off till tomorrow what we should be taking care of today. Japan’s government should not waste any more tax money on this fruitless FBR project. I hope they have the courage to decommission Monju as soon as possible. Fukushima Minpo – By the end of January 2016, Japan’s Ministry of the Environment had visited some 1,220 of the total 2,365 owners of lands that are candidates for intermediate storage, surveying some 810 premises and buildings. The Ministry then presented the purchase price estimates for the land, but so far only 44 purchase agreements have been signed. Moreover, the Ministry has yet to contact some 1,000 land owners. The total land involved equals some 16 square km (3,953 ac), which is quite large. Also, large areas of land are necessary for the temporary storage of waste from the decontamination process. The pieces of land acquired so far are not contiguous. “We cannot begin the storage work with such limited amounts of land,” say some personnel involved in the process, with their heads in their hands. 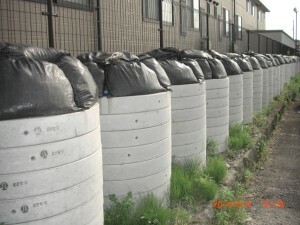 Asahi Shimbun – Decontamination work in Fukushima is leaving heaps of collected radioactive waste behind in the towns. While Japan’s Ministry of the Environment has been negotiating with the owners of land which could be used for intermediate waste storage, the Ministry is short of negotiators and many of the land owners are reluctant to leave their current residences. Thus, the negotiations have been stymied. Meanwhile, those living outside the area that the Ministry wants for intermediate waste storage want the quick removal of radioactive waste from their towns. Fukushima’s prefectural government is now involved in the negotiations. Asahi Shimbun –Decontamination work removes things contaminated by radioactive fallout from the meltdown of TEPCO’s Fukushima Daiichi. The work leaves behind piles of contaminated soil, etc., which need a place for intermediate storage. So far, less than 1% of the land needed has been acquired. Though negotiations with the relevant land owners have been in progress for more than a year now, work on land price estimates is stagnant. Currently, no one knows where the radioactive waste left behind in Fukushima can be stored. Fukushima Minpo – The pilot (trial) transfer of radioactive waste contaminated with fallout from the Fukushima Daiichi meltdown into intermediate storage sites is expected to be completed sometime this March. In this pilot transfer, begun on March 13, 2015, the Ministry of the Environment will move some 1,000 cubic m (264,172 US gallons) of contaminated soil, grass, trees, burnt ashes, etc., having 100,000 becquerel or more per kg (2.2 lb. ), collected from 43 municipalities in Fukushima, into each storage site. The transfer will take a year or more to complete. Much of the land desired for intermediate storage of radioactive waste from the meltdown of TEPCO’s Fukushima Daiichi Nuclear Power Plant (NPP), surrounds the NPP. This land is in the “no return zones,” where radioactivity is high and citizens are not permitted to enter without special permission. The Fukushima Prefectural Government, and the municipal governments of Okuma and Futaba towns, decided to store radioactive waste from the decontamination work almost a year ago. Japan’s Ministry of the Environment has been carrying out a pilot (trial) transfer of some radioactive waste into temporary storage facilities built on such land. The transfer should end sometime in March 2016. I am a resident in Koriyama, Fukushima, and every day I see piles of waste along the streets. At many houses, waste from the decontamination of the house is simply buried under the garden. True, the decontamination reduced the radioactivity of the house a bit, but it is creepy to know that some radioactive waste lies beneath the yard. Living here means that you will never be free from radioactivity. Collected radioactive soil, packed in vinyl bags and then in concrete pipes, are lined up just outside an apartment house in the neighborhood of our Project’s office. Workers digging a hole in a house yard to bury radioactive waste from decontamination. To rebuild Fukushima, we have to decide soon where all the radioactive waste will go. No future generation should have to live among heaps of radioactive waste. I do wish for intermediate storage for all the hazardous waste as soon as possible so that our children and their children can live in safety. Yet at the same time, many land owners are reluctant to sell their land for intermediate storage sites, knowing their own life stories are in the land. This issue has no easy solution.